Gasoline Gensets Industry « Global Market Insights, Inc. The rising cases of weather-related blackouts along with the surging demand for efficient power backup solutions have fueled gasoline gensets market growth lately. High frequency winds, especially during seasonal storms, usually cause damage to electric utility systems, resulting in service interruptions to large numbers of electricity customers. Such power outages are primarily caused by trees falling on local electricity lines and poles which carry bulk power to long distances. In such scenarios, people tend to rely on backup generators such as portable gasoline gensets to power their commercial or residential electric needs. The product offers simpler installation & operation, affordable power, easier fuel availability, and high portability, factors that will certainly stimulate gasoline gensets industry in the coming years. 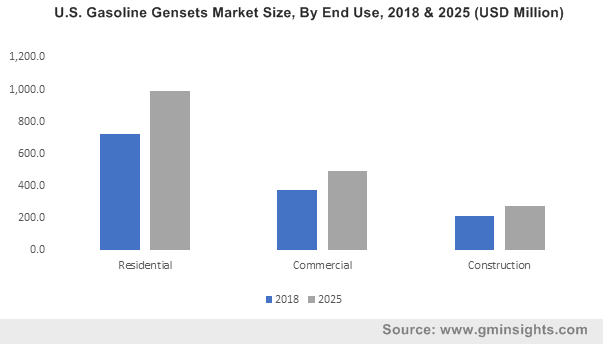 It is vital to mention that the residential sector accounted for over 50 percent of the gasoline genset market share in 2018. The product’s compact size and easy installation & maintenance makes it perfect for operating several household appliances or other power requirements during outages. Indeed, a gasoline genset over 1KW can effectively power household appliances like microwave ovens, toasters and other electrical cooking appliances, helping in meal preparation at times of prolonged outage scenarios. The product’s portability also makes it ideal for people camping in remote locations like forests lacking any means of electricity. Escalating severity of weather-related outages and intensifying utility power supply load along with growing consumer demand for backup power solutions will thus drive the gasoline gensets industry growth from residential applications in the years ahead. Escalating consumer inclination toward buying high power compact gasoline gensets, especially with a power rating of 2kVA-3.5kVA and 3.5kVA-5kVA power rating, will be a major factor driving the industry growth. These units are attached with durable wheels for easier portability, offering users a lightweight, operational suitability, and compact backup solution for required power needs. The product will high power output can easily run several electrical appliances simultaneously for prolonged hours, encouraging their massive adoption. Three-phase gensets are generally installed across commercial environments and for industrial power applications for seamless power backup requirements. The product’s invariable power supply, high flexibility, and appreciable material efficiency feature helps maintain the mains voltage with high accuracy, thus allowing connection to equipments sensitive to voltage changes and spikes. Such generators also supply power to loads with the reactive component up to 65% of the nominal value. The adoption of three-phase generators will thus help support commercial operations regardless of power outages, further helping avoid financial losses and meeting project deadlines particularly at construction sites. This would in consequence, massively expedite the product adoption, stimulating gasoline gensets industry growth. Speaking of the regional spectrum, the United States is anticipated to evolve as one of the most significant geographical terrains for the gasoline gensets market. As a matter of fact, the U.S. gasoline gensets industry registered yearly sales of over 1.5 million units in 2018. The rapidly increasing intensity and frequency of weather-related disasters leading to long-lasting outages are expected to boost the product adoption in the region. According to reports, around 87% of power outages are caused by severe weather in the U.S. affecting over 50,000 customers. The region has witnessed a dramatic increase in power outages in the past few years as Hurricane Sandy, Irene and other major storms had led to extensive damage to power utilities. To be prepared for such scenarios, the region has been increasingly adopting portable and compact gasoline gensets for homes and other establishments to power basic electricity requirements, thereby driving U.S. gasoline gensets industry growth. Key industry players including Honda, Yamaha Motor, Cummins, Kirloskar, Kohler, Caterpillar, Atlas Copco, John Deere, amongst others, are operating across the global gasoline gensets market and are constantly seeking new technological advancements to offer better customer satisfaction. Companies are also seemingly trying to remain compliant with emission standards, thereby offering energy efficient units and extending their service & distribution networks to attain a competitive position in the gasoline gensets market. This entry was posted in ENERGY, MINING, OIL AND GAS and tagged Gasoline Gensets Industry, Gasoline Gensets Market, Gasoline Gensets Market Analysis, Gasoline Gensets Market Growth, Gasoline Gensets Market Outlook, Gasoline Gensets Market Pdf, Gasoline Gensets Market Price, Gasoline Gensets Market Report, Gasoline Gensets Market Share, Gasoline Gensets Market Size, Gasoline Gensets Market Trends.